Hello! Happy belated Earth Day and happy 7th birthday to the Climate Change Fork blog! We are guest bloggers Nataly Azouly and Anelisa Defoe. Respectively, our majors are Actuarial Mathematics (BS) with a minor in Physics, and Physics (BA) and Exercise Science (BS). We will graduate from Brooklyn College CUNY in May of 2019. Under the guidance of Micha Tomkiewicz, PhD, we have been able to use our backgrounds and experiences to better understand the importance of regulating carbon emissions for the benefit of our planet. A carbon tax in the US was initially proposed in 1990 in response to the IPCC’s First Assessment Report, as a measure for reducing greenhouse gas production. It was met with bipartisan opposition repeatedly until the late 2000s, when the 2007 IPCC Fourth Assessment presented more aggressive evidence of global warming1. The 2016 Paris Agreement emphasized the importance of reducing the carbon footprint worldwide, mandating that signatory nations make a joint commitment to reinforce efforts to mitigate climate change2. Implementing a carbon tax in the US presented an effective means for discouraging the consumption of energy from nonrenewable sources while promoting clean energy alternatives. Presently, there are no active carbon tax policies enforced at either state or federal levels in the US. A 2016 publication by the Congressional Budget Office proposed a plan for an annual increase of revenue through carbon taxation3. This initial, forceful approach to carbon taxation planned to generate $32.9 billion between 2017 and 2018. A trend of 2% annual increase in the tax would be implemented and result in a net federal revenue increase of $977.2 billion between 2017 and 2026. Consequently, businesses’ costs would increase while income and payroll taxes decreased. If approved, CO2 emissions would be taxed $25 per metric ton based on CO2e (equivalents) necessary to cause warming. Carbon emissions would be predicted to decline by 9% within the 1st decade of enforcing carbon taxes. The proposal offers a model for state governments to adopt and modify the measure for an optimal increase in revenue. However, the plan has not been passed into law anywhere. Oppositional arguments against a carbon tax assert that reducing US carbon emissions would destabilize the economy by increasing cost production of emission-intensive goods and services. Indeed, without empirical data to reference, the socioeconomic risk-benefit ratio for residents is uncertain. 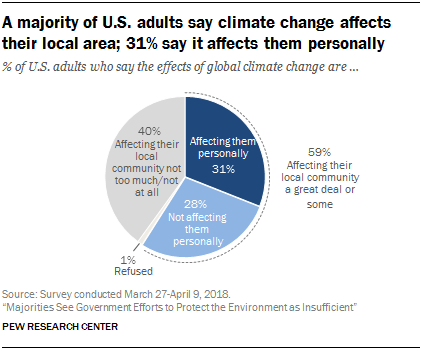 Therefore, it is plausible that a reduction in climate change might more immediately benefit other countries, particularly developing ones, as opposed to the US. Another argument suggests that industries with high emission rates might simply relocate to other countries that have minimal restrictions on the use of nonrenewable resources. Consequently, the carbon tax would prove ineffective overall in reducing the global carbon footprint. A January 2019 publication by the Center for Climate and Energy Solutions (C2ES) reports state efforts to target the transportation sector4. The sector’s increase in carbon emissions nationwide between 1990 and 2016 attests to the need for regulation. At present, 14 states have proposed legislation to encourage a transition to zero emission vehicles (ZEV). ZEVs include both plug-in and fuel cell electric vehicles, thereby deviating from the use of traditional gas for motor vehicles. Under section 209 of the Clean Air Act, California has the ability to spearhead operations that place greater restrictions than the federal government on carbon emissions. Similarly, under section 177 of the Clean Air Act, states such as New York, New Jersey, Colorado, and others may enforce comparable policies reflective of California’s precedent. At the congressional level, the cap and trade model serves as the primary mode for reducing carbon emissions5. Instead of taxing emissions, the government limits how much carbon various factions may produce. These limitations are measured in metric tons that companies and other groups may not exceed. This model serves the interests of the private sector more effectively than it reduces net carbon emissions. As observed in other countries, a carbon tax would yield greater results for reducing emissions. On a global scale, economists endorse the carbon tax as being the most effective tool for both reducing the carbon imprint6 and encouraging the advent and refinery of prospective technologies. Its implementation in an array of countries demonstrates that its success rate is dependent on the dynamic systems that constitute a particular society. A March 2016 New York Times publication confirmed the difficulty of British Columbia’s (BC) task to institute a carbon tax7. Between 2008 and 2012, carbon emissions there fell 10%. With a tax of about $22.20 US per ton of CO2 emissions, revenues stimulated the economy and gradually gained voter acceptance. However, in response to stagnation in the tax’s growth, carbon emissions began to increase. To continue reducing the carbon imprint via taxes, BC must increase the tax at a rate of $7.46 US per ton annually. This task has been met with the above-mentioned challenge of preventing businesses from relocating to other countries with fewer restrictions on carbon emissions. Anthesis Enveco’s March 2018 overview of Swedish carbon tax details a successful 26% decrease in carbon emissions between 1991 and 20168. It is noteworthy however, that Sweden has a historical affinity for renewable energy resources to substitute fossil fuel consumption; in juxtaposition, BC has a far greater dependence on companies that are incentivized by cheaper nonrenewable energy. Sweden has access to biomass and hydropower to generate energy. Furthermore, the country’s carbon tax is complemented by legislation that predates it—including a cap and trade model—as well as a transition to ZEVs (like the US), and a combination of prolific resources and government initiatives. Similarly, Norway implemented a carbon tax in 1991. The target goal is to have a 40% reduction of carbon emissions, relative to the 1990s, by 20309. Mirroring Sweden’s approach, a carbon tax in conjunction with incentives to transition to battery electric vehicles would further mitigate the carbon footprint. It is also essential to note that—as with Sweden—Norwegian energy systems are already 98% renewable. Therefore giving up reliance on coal-based energy sources does not present the same adversity as it does in British Columbia. A carbon tax is designed to reduce fossil fuel emissions. Placing a carbon tax on fossil fuels would essentially raise the prices for consumers and force households and corporations to make decisions regarding their consumption of said fuels accordingly. Instead of allowing the market to naturally adjust its price based on supply and demand, issuing a carbon tax would therefore give the government a greater amount of market power, leaving room for alternative energy sources to become competitive. According to the law of demand (Mankiw), all other things equal, when the price of a good rises, the demand for the good falls. Essentially, an individual or group would be incentivized to consume fewer fossil fuels solely based on an increase in price. In order to create a demand curve, data was collected comparing the price of crude oil (USD) to the CO2 emissions (kilotons) in the US during the corresponding year. Since 82% of greenhouse gas emissions in the US are a result of the burning of oil, coal, and natural gas, the price of crude oil will be used as a proxy to represent the price of fossil fuels in the United States. In addition, CO2 emissions will be used as a proxy to represent fossil fuel consumption. The data we are using was collected from the years 1997 to 2014 by the World Bank and Macrotrends. Our hypothesis states that, based on the nature of the law of demand in macroeconomics, a carbon tax is an effective tool to mitigate CO2 emissions. A regression is a measured relationship between the average value of the dependent variable and the input value of the independent variable. In this case, the independent variable is “Price,” the price of crude oil in USD, and the dependent variable is CO2, the carbon emissions in kilotons. 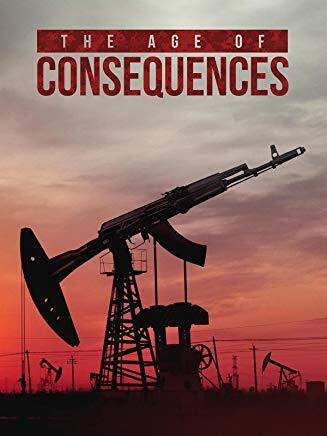 Due to the negative coefficient of the price of crude oil in the US, this implies that when the price of oil is increased by $1, the predicted average CO2 emissions decreases by 2999.6 kilotons. Therefore, there is an inverse relationship between CO2 emissions and the price of oil as predicted by the law of demand. This equation can also be used to predict the shape of the demand curve of oil in the United States. This distribution has an R2 value of 0.18. R2 is statistical measure that explains the proportional effect a variable has on the variation of another variable. In this case, it means that the price of crude oil explains an 18% variation in carbon emissions—a large value for cross-sectional data. This makes it a significant variable in predicting carbon emissions in a given year. Where A is the coefficient of the variable Price. In this case, t = −1.854 and −tα/2,n−1 = -1.7396. Since −1.854 < -1.7396, we reject the null hypothesis in favor of the alternative hypothesis that the coefficient of the Price is less than 0. A negative correlation is a relationship between two variables such that as the value of one variable increases, the other decreases. Therefore, as the price of crude oil increases, CO2 emissions decrease. This can imply that there is an inverse relationship between the price of carbon and its consumption. According to these results, a carbon tax would effectively mitigate the use of fossil fuels in the United States. Approximately 82% of greenhouse gas emissions in the US are a result of our burning oil, coal, and natural gas. The objective of this research was to determine the effectiveness of a carbon tax to mitigate the use of fossil fuels and reduce carbon emissions. Through observation of countries with successful carbon tax policies, current legislation concerning fossil fuel production and consumption, and statistical analysis, we determined that implementing a carbon tax is an effective tool in mitigating carbon emissions by demonstrating that there exists an inverse relationship between the price of fossil fuels and their consumption. Our analysis shows that a carbon tax is an effective method to mitigate the use of fossil fuels. The creation of a carbon tax raises the issue of what to do with the tax revenue raised by this new policy. Proposals have included issuing a rebate, investing in clean energy technology, and using these funds to decrease the US government’s deficit. We determined that the best uses for the revenue generated from a carbon tax would be to offer a rebate to lower and middle class individuals while also investing in research for new technologies in clean and renewable energy in order to decrease the costs of renewable energy sources and methods. 1 “Know the Legislation.” Price on Carbon. 4 Jan. 2019, 21 Apr. 2019, https://priceoncarbon.org/business-society/history-of-federal-legislation-2/. 2 “Paris Climate Agreement Q&A.” Center for Climate and Energy Solutions. 7 Jan. 2019, 21 Apr. 2019, https://www.c2es.org/content/paris-climate-agreement-qa/. 3 “Impose a Tax on Emissions of Greenhouse Gases.” Congressional Budget Office, 8 Dec. 2016, www.cbo.gov/budget-options/2016/52288. 4 “U.S. 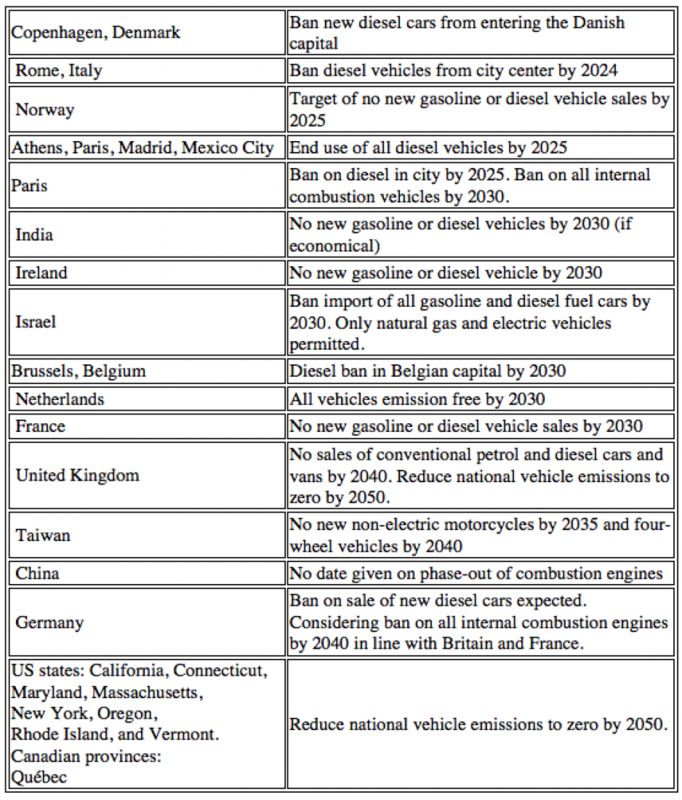 State Clean Vehicle Policies and Incentives.” Center for Climate and Energy Solutions, 15 Feb. 2019, www.c2es.org/document/us-state-clean-vehicle-policies-and-incentives/. 5 Specht, Steven. “Developing an International Carbon Tax Regime.” Sustainable Development Law & Policy, vol. 16, no. 2, 2016, pp. 30–31, https://digitalcommons.wcl.american.edu/sdlp/vol16/iss2/5/. 6 Specht, Steven. “Developing an International Carbon Tax Regime.” Sustainable Development Law & Policy, vol. 16, no. 2, 2016, pp. 29–30, https://digitalcommons.wcl.american.edu/sdlp/vol16/iss2/5/. 7 Porter, Eduardo. “Does a Carbon Tax Work? Ask British Columbia.” The New York Times, 21 Dec. 2017, www.nytimes.com/2016/03/02/business/does-a-carbon-tax-work-ask-british-columbia.html. 8 Scharin, Henrik, and Jenny Wallström. “The Swedish Carbon Tax- An Overview.” 5 Mar. 2018, pp. 17–30, www.enveco.se/wp-content/uploads/2018/03/Anthesis-Enveco-rapport-2018-3.-The-Swedish-CO2-tax-an-overview.pdf. 9 “Putting a Price on Emissions: Polluters Should Pay.” 2 Apr. 2018, www.unfccc.int/sites/default/files/resource/119_TalanoaSubmissionNorway1apr2018END_rev.pdf. 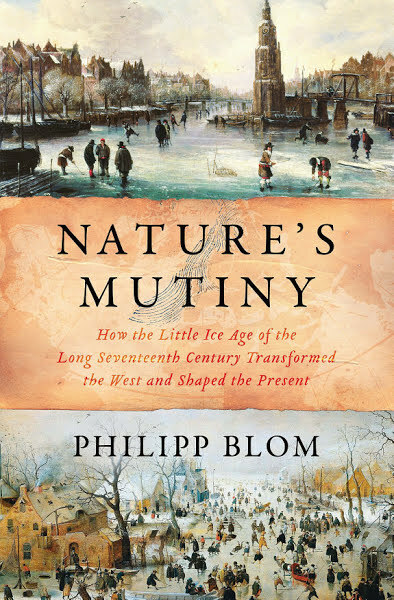 Last week, I talked about Philipp Blom’s book, “Nature’s Mutiny.” It illustrates some of the historical impacts of global climate change, especially with regards to the stress that it has inflicted on society. The book also looks into some of the consequences that have carried over into present day. Blom is a historian and confines his scope to the Little Ice Age’s effects on European societies in the 16–17th centuries. At the beginning of this book, I asked a straightforward question: What changes in a society when the climate changes: For the early modern period, it appears that the crisis of agriculture following environmental cooling accelerated a social and economic dynamism carried by a rising middle class, by stronger trade, empirical knowledge, expanding literacy, growing markets, and intellectual renewal. The result was a move from feudal to capitalist societies, from the fortress to the market. Daniel Gabriel Fahrenheit invented the first accurate thermometers and standardized their measurements at the peak of the Little Ice Age (using alcohol in 1709 and mercury in 1714). Yet we can now measure temperatures even further back by using proxies (paleothermometry in professional jargon). Figure 1 shows temperature measurements for the past two thousand years, as reconstructed by different scientists using proxies such as ice cores, tree rings, sub-fossil pollen, boreholes, corals, lake and ocean sediments, etc. We can see that the results roughly agree with the variabilities in each proxy. The solid black line on the right shows direct measurements. The most recent value (2016) is also shown. The figure as a whole demonstrates the so-called hockey stick shape – approximately flat (average) variability throughout history, with a sharp rise in the 20th century when the anthropogenic contributions started to increase exponentially. 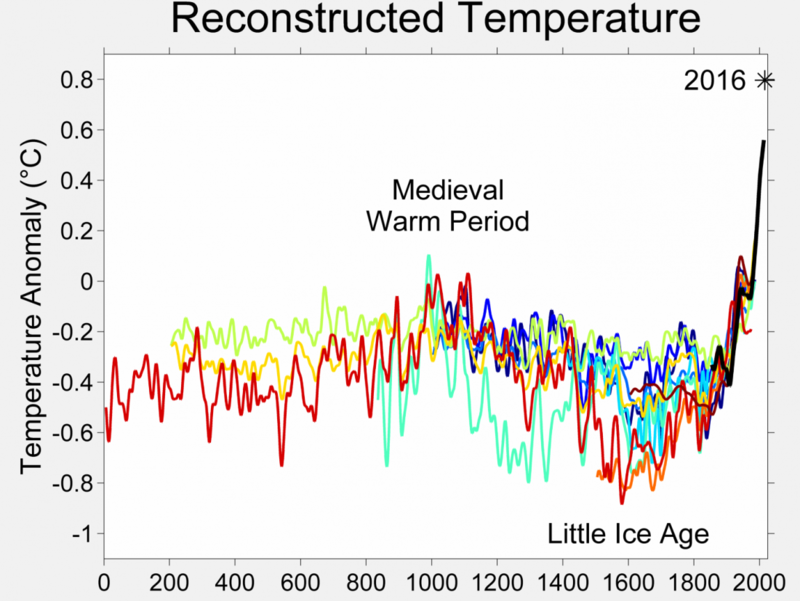 We can also see the temperature profile of the Little Ice Age and the medieval warm period that preceded it. The way that the Little Ice Age follows the medieval warm period so quickly leaves me to think that another effect, not mentioned in Blom’s book, played an important role in the socioeconomic response from the European population at the time. This missing factor is called the “shifting baseline syndrome,” which I addressed in my April 18, 2017 blog. Most of the agricultural practices during the Little Ice Age were set earlier, in warmer times. The general impact of a baseline on many of our practices (see fishing in Figure 2) must always be considered. Namely, what worked for previous generations will not always work for newer ones, once the definition of what is “normal” changes along with the physical environment. Beginning in the spring of 1315, cold weather and torrential rains decimated crops and livestock across Europe. Class warfare and political strife destabilized formerly prosperous countries as millions of people starved, setting the stage for the crises of the Late Middle Ages. According to reports, some desperate Europeans resorted to cannibalism during the so-called Great Famine, which persisted until the early 1320s. Typically considered an outbreak of the bubonic plague, which is transmitted by rats and fleas, the Black Death wreaked havoc on Europe, North Africa and Central Asia in the mid-14th century. It killed an estimated 75 million people, including 30 to 60 percent of Europe’s population. Some experts have tied the outbreak to the food shortages of the Little Ice Age, which purportedly weakened human immune systems while allowing rats to flourish. In the first half of the 17th century, famines and floods caused by unusually cold, dry weather enfeebled China’s ruling Ming Dynasty. Unable to pay their taxes, peasants rose up in revolt and by 1644 had overthrown the imperial authorities. Manchurian invaders from the north capitalized on the power vacuum by crossing the Great Wall, allying with the rebels and establishing the Qing Dynasty. In 1484, Pope Innocent VIII recognized the existence of witches and echoed popular sentiment by blaming them for the cold temperatures and resulting misfortunes plaguing Europe. His declaration ushered in an era of hysteria, accusations and executions on both sides of the Atlantic. Historians have shown that surges in European witch trials coincided with some of the Little Ice Age’s most bitter phases during the 16th and 17th centuries. Among other military conflicts, the brutal Thirty Years’ War between Protestants and Catholics across central Europe has been linked to the Little Ice Age. Chilly conditions curbed agricultural production and inflated grain prices, fueling civil discontent and weakening the economies of European powers. These factors indirectly plunged much of the continent into war from 1618 to 1648, according to this model. When Spanish conquistadors first introduced the potato in the late 16th century, Europeans scoffed at the unfamiliar starch. In the mid-1700s, however, some countries began promoting the hardy tuber as an alternative to crops indigenous to the region, which often failed to withstand the Little Ice Age’s colder seasons. It soon caught on with farmers throughout Europe, particularly in Ireland. As the 18th century drew to a close, two decades of poor cereal harvests, drought, cattle disease and skyrocketing bread prices had kindled unrest among peasants and the urban poor in France. Many expressed their desperation and resentment toward a regime that imposed heavy taxes yet failed to provide relief by rioting, looting and striking. Tensions erupted into the French Revolution of 1789, which some historians have connected to the Little Ice Age. 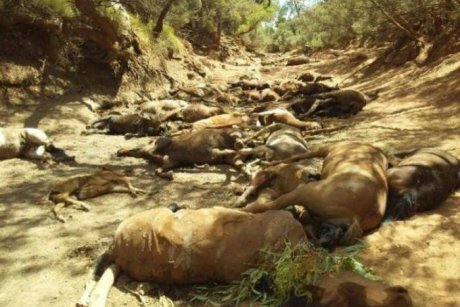 Also in 1816, a meager oat harvest forced many German farmers to shoot their starving horses. The subsequent need for transportation that didn’t require food is thought to have inspired the aristocrat Karl Drais von Sauerbronn to invent his “laufmaschine,” a pedal-free precursor to the modern bicycle. On the other side of the Atlantic, the year without a summer convinced many New England residents to relocate. Horrified by escalating grain prices and June snowfalls, they settled in the Midwestern United States, providing a boost to the expansion movement that had begun two decades earlier. In the next few weeks we will have a few guest blogs written by my students. Following those, I will return to the issue of how climate change is inducing global stress. As I have often mentioned here, I teach two courses that relate to climate change at my university: the advanced Physics and Society and the general education Energy Use and Climate Change. This blog plays an important role in both classes. I try to teach advanced physics students how to relate to current events in a language that is understandable to the voting public. I also try to teach general education students how to analyze relatively complex societal issues that relate to the physical environment on a level where they can make judgements based on first principles in sufficient depth to be able to vote and participate in the political and social dialogue. You will be the judge of the advanced physics students shortly when they submit four guest blogs on key issues that we are facing today. You have also gotten to judge the general education students on the various comments that they have posted throughout (see for example my April 7, 2015 blog). Understanding societal issues that affect our physical environment necessarily involves numbers and data. Today’s blog on electric cars and power sources, which follows last week’s blog on the same topic, is a good example of this effort. In the figure below, the only parameter directly measured is fuel economy. The input data include: fuel economy of 26 MPG (miles per gallon); fuel consumption of 3.8 gallons per 100 miles; $2150 annual fuel cost; savings of $1850 in fuel costs over 5 years. The environmental impact shows up on a sliding scale (1 to 10 where 10 is the best). Actual results will vary for many reasons, including driving conditions and how you drive and maintain your vehicle. The average new vehicle gets 22 MPG and costs $12,600 to fuel over 5 years. Cost estimates are based on 15,000 miles per year at $3.70 per gallon. MPG is miles per gasoline gallon equivalent. Vehicle emissions are a significant cause of climate change and smog. Fuel consumption of 26 MPG means 100/26 = 3.8 gallons per 100 miles (rounding all answers to the nearest tenths). Fuel costs of $3.70 per gallon means 3.8 x 3.7 = $14 per 100 miles of travel. With 15,000 miles/year, the annual cost for fuel will be $2100. The reference car makes 22 MPG or 100/22 = 4.5 gallons per 100 miles, so with the same 15,000 miles/year, the annual cost will be $2550. The savings will be 2550 – 2100 = $450 per year and 5 x 450 = $2250 per 5 years. This is a bit different from the $1850 in savings that the sticker advertises, albeit in a better direction. The environmental part of the sticker doesn’t provide any details and clicking on it gets us to the EPA (Environmental Protection Agency) site. In the almost unreadable part below the sliding scale, we learn that the environmental impact takes into account only the emissions from the exhaust, which amount to 347g CO2/mile. This vehicle emits 347 grams of CO2 per mile. The best emits 0 grams per mile (tailpipe only). Producing and distributing fuel also creates emissions; learn more at fueleconomy.gov. “Simple” calculation (the principle of which I show in Box 1) indicates that burning 1 gallon of gasoline liberates 8.3kg of carbon dioxide, which translates to 316g of carbon dioxide per mile traveled, which is closer to the number quoted in the sticker than 2250 is to 1850. The table below shows fuel costs for 100 miles of travel and carbon emissions of conventional and electric Nissan vehicles (data from The New York Times, May 29, 2011). Calculate the data in Table 2b from the data in Table 2a and pay attention to how you get there. I will leave aside the conventional Altima, which is basically the same as the previous calculation, and concentrate on the electric car. Just comparing the numbers for the two cars in 2b, (without getting too into the math) we arrive at a fascinating conclusion – if the energy mix for the Leaf were different, it could conceivably have a higher carbon footprint than the Altima. As it stands, three fuels that power the electricity production for the Leaf, shown in the table, emit carbon dioxide: coal, gas, and oil. I will ignore the oil here because it’s only 1% of the mix. To power 100 miles of the Leaf, I need 7.27 x 3.3 = 24 kWh (kilowatt-hours is a unit of energy). 47% of this energy comes from coal and 20% comes from natural gas. Here we need some basic background information to calculate the resulting carbon footprint. I am including Box 1 from a chapter in my book that focused on calculating energy audits and carbon footprints. Appendix 1 tells me that 1 kWh = 3414 Btu. This appendix also tells me that 1 Btu = 0.25 Cal. Following our previous discussion, 1kwh* (3414Btu/1kwh)*(0.25Cal/1Btu) = 3414 × 0.25 Cal = 853Cal. So my average daily electric consumption is 7.9 × 853 = 6739 Cal/day. The typical conversion efficiency of an electric generator is 30%. So the actual energy needed to supply my 6739 Cal/day of electricity usage is actually 6739/0.3 = 22,463 Cal/day. As was discussed in Chapter 11, my utility company can use many primary fuels to produce this energy. I will use natural gas as an example, so our previous calculations for natural gas become relevant. The number of moles my utility company will need to produce my daily electric energy is 22,463/210 = 107 moles/day of methane. This corresponds to 107 × 16 = 1712 g (1.7 kg) of natural gas, the burning of which will produce 107 × 44 = 4708 g (4.7 kg) CO2. The calculations will change slightly (creating more CO2) if my utility company is using coal to produce the steam and change in a major way (creating no CO2) if my utility is using nuclear energy to boil the water or hydropower to run the turbines. My calculations show that for the given power mix we emit 35.3lbs of carbon dioxide (not 63.6lbs as marked in the table). I will also neglect the fuel production cost of the power source. If, on the other hand, we say that the only power source is coal, we will get emissions of 63lbs—almost double. Table 2 below shows that use of 70% of world coal is concentrated in China, the US, and India. 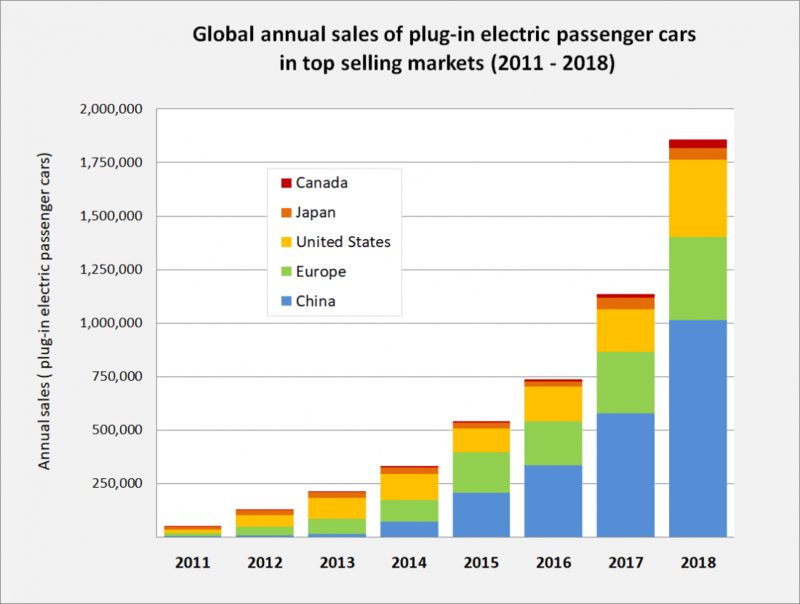 As last week’s blog showed, China and the US are two of the largest producers of electric vehicles. France gets more than 90% of its electricity from carbon-free fuels—72% from nuclear energy and 17.8% from renewables—meaning that it only gets about 8.6% from fossil fuels. In other words, it’s an ideal place to run electric cars. (source: BP). The world data are given in Terawatt-hours (trillion watt-hours) the rest of the data are given as percentages of those totals. My next blog will list the countries and cities that have announced commitments to block the sale of cars that emit carbon dioxide: no more fossil fuel-based cars. Unfortunately, the announcements have yet to include parallel commitments about changing the power sources for these cars. Close to three weeks ago (February 24th), I watched a 60 Minutes segment on electric car production in China. I was impressed with the Chinese efforts to promote the transition, including waiving the high tax on license plates in Shanghai (see my August 18, 2015 blog). 60 Minutes explained that this was an attempt to reduce the horrendous air pollution in the country’s large cities. 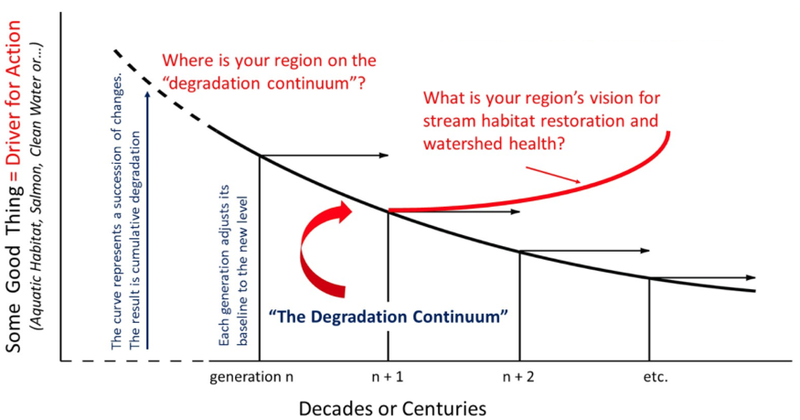 The opening picture, which I found on the blog EV World, summarizes the issue (although in that blog’s context, it is used ironically, to demonstrate what the authors view as a mischaracterization). 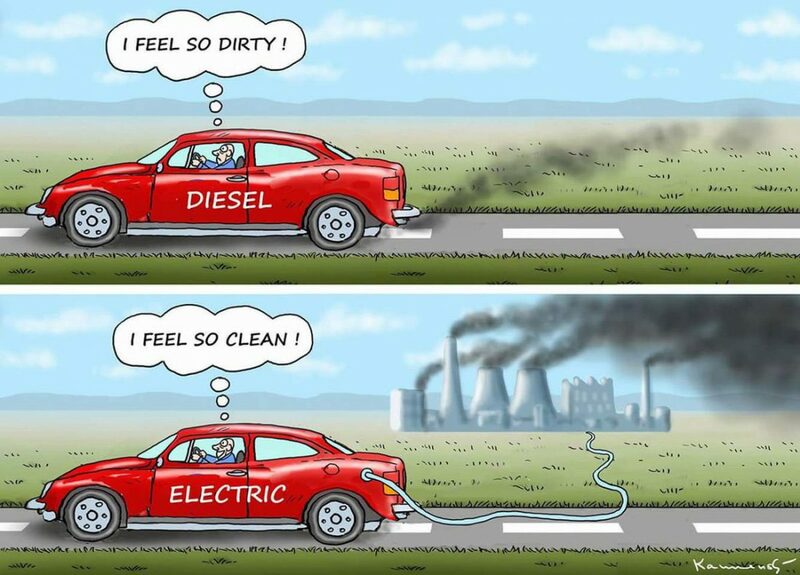 Electric cars obviously run on electricity, and as long the power sources for that electricity are not clean, the environmental arguments for electric cars don’t hold. My next few blogs will focus on this issue. 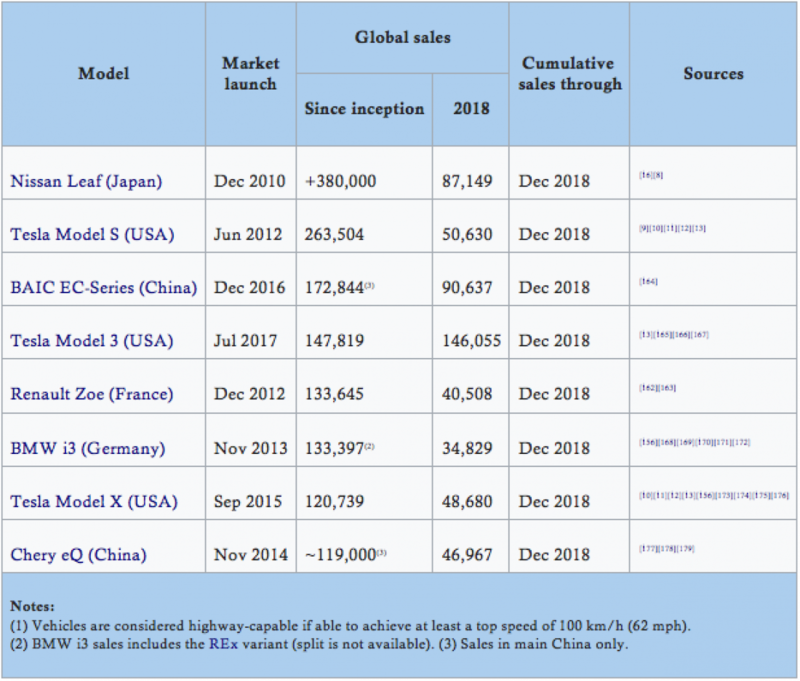 Figure 1 and Table 1, taken from the Wikipedia entry on electric cars, summarize the extent to which electric cars have penetrated the market. Electric cars have several benefits over conventional internal combustion engine automobiles, including a significant reduction of local air pollution, as they do not directly emit pollutants such as particulates (soot), volatile organic compounds, hydrocarbons, carbon monoxide, ozone, lead, and various oxides of nitrogen. Depending on the production process and the source of the electricity to charge the vehicle, emissions may be partly shifted from cities to the material transportation, production plants and generation plants. The amount of carbon dioxide emitted depends on the emissions of the electricity source, and the efficiency of the vehicle. For electricity from the grid, the emissions vary significantly depending on your region, the availability of renewable sources and the efficiency of the fossil fuel-based generation used. The same is true of ICE vehicles. The sourcing of fossil fuels (oil well to tank) causes further damage and use of resources during the extraction and refinement processes, including high amounts of electricity. In December 2014, Nissan announced that Leaf owners have accumulated together 1 billion kilometers (620 million miles) driven. This translates into saving 180 million kilograms of CO2 emissions by driving an electric car in comparison to travelling with a gasoline-powered car. In December 2016, Nissan reported that Leaf owners worldwide achieved the milestone of 3 billion kilometers (1.9 billion miles) driven collectively through November 2016. 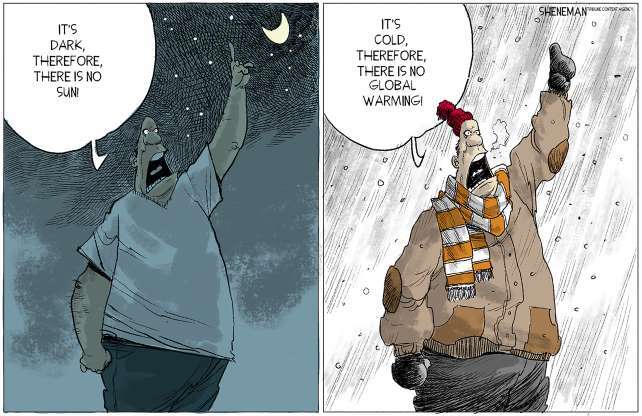 Part of my objective in teaching classes on climate change to a student population that does not necessarily have a background in the sciences (many of them have never taken any chemistry or physics) is to enable them to judge environmental claims from first principles. Below, I am giving two examples from this effort that are relevant to the environmental claims of electric cars. In Figure 2 below, the only parameter directly measured is fuel economy. I ask students to quantitatively determine the assumptions needed to calculate the other numbers in the banner. Try to do it and you will quickly find that the task is impossible—not because you lack the background or haven’t taken my course but because of the size of the small print at the bottom of the sticker. With this information, the exercise should be easier. Let me know in the comment section how you are doing with it. Table 2 – Fuel costs for 100 miles of travel and carbon emission of conventional and electric Nissan vehicles (data from The New York Times, May 29, 2011). Calculate the data in Table 2b from the data in Table 2a and pay attention to how you get there. Let me know in the comment section what you find. Tune in next week for my take. I use the cartoon above to teach my students one of the most fundamental tenets of physics, unimaginatively called the “Second Law of Thermodynamics.” A quick Google search will tell you that thermodynamics is, “the branch of physics that has to do with heat and temperature and their relation to energy and work” (Wikipedia). The law states that, “left on their own, systems tend to maximize their disorder.” Disorder in physics is measured with a function called entropy (you can Google that as well). We don’t need the exact definition of entropy here; we can all grasp the concept of disorder. One of the better-known examples is the room of a small child, when left on its own. 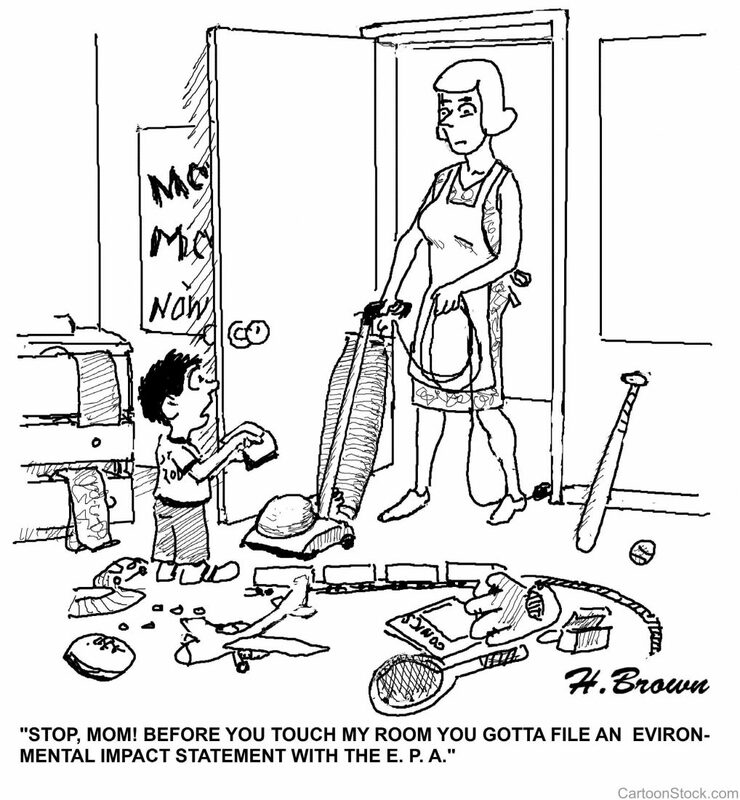 The room, obviously can be cleaned by adults—or if the child is a bit older, by incentivizing the child to do it himself. But this kind of “fixing” doesn’t defy the law because it means the room is not being “left on its own.” The point of an Environmental Impact Statement (usually employed when a structure is scheduled to be built or a massive project is underway) is to predict how a project will impact (create “disorder” in) the rest of the system or surrounding area and what kind of intervention will be needed to mitigate those detrimental effects. Policymaking on all levels is now (very slowly) starting to factor in the impacts climate change has (or will have) on almost every global economic activity. I have described some examples in earlier blogs (just type economic impact into the search box above). 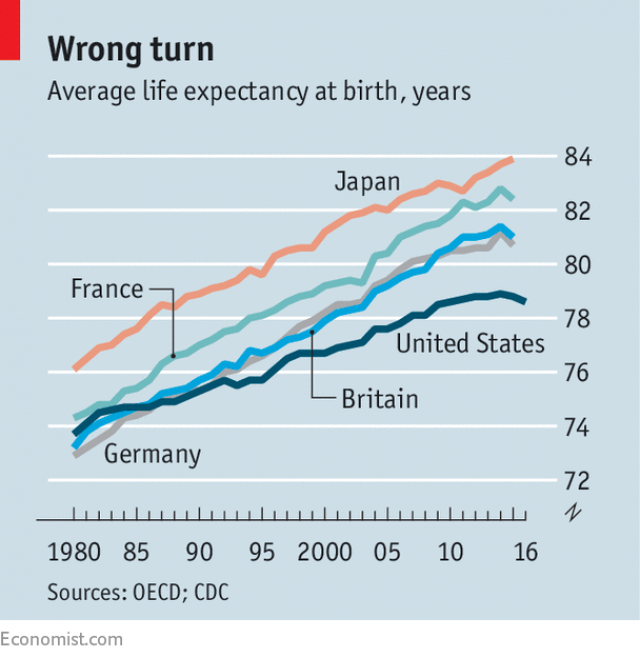 The current political climate in many countries is not exactly encouraging for productive consideration. Nonetheless, these discussions are still taking place, with the hope that global environmental considerations will play increasing roles. In the US, federal laws and regulations require an Environmental Impact Statement (EIS) to evaluate the effects of certain actions on the environment and to consider alternative courses of action. The National Environmental Policy Act of 1969 (NEPA) specifies when an environmental impact statement (EIS) must be prepared. NEPA regulations require, among other things, for federal agencies to include discussion of a proposed action and the range of reasonable alternatives in an EIS. Sufficient information must be included in the EIS for reviewers to evaluate the relative merits of each alternative. The Council for Environmental Quality’s (CEQ) regulations provide the recommended format and content. other activities, including the production of pulp, paper and cardboard, pre-treatment and dyeing of textiles, tanning of hides and skins, disposal or recycling of animal carcasses, and intensive rearing of poultry or pigs. Meanwhile, Bloomberg terminals now include ESG (Environmental, Social, and Governance) information (“Integrating Sustainability into capital markets”) that can be incorporated into many economic decisions. D.C. Circuit holds federal energy regulators must consider pipeline project’s impact on climate change. Is climate change a “reasonably foreseeable” consequence from a government agency’s approval of a natural gas pipeline? What if an entirely separate agency regulates the facilities that will actually burn the transported gas? And what if the construction of the new pipeline would enable the retirement of older coal-powered plants and thus lessen overall climate impacts? A three-judge panel of a federal court of appeals recently grappled with these questions and determined that the Federal Energy Regulatory Commission (FERC)—in considering and approving the construction of a natural gas pipeline project—should have considered the eventual burning of natural gas when weighing environmental concerns. In addition, the National Environmental Policy Act of 1969 (NEPA) requires that federal agencies produce an “environmental impact statement” (EIS) for all “major Federal actions significantly affecting the quality of the human environment.” The EIS must address potential “adverse” consequences of the action and possible alternatives to it. Shortly after FERC completed its EIS for the natural gas pipeline at issue in Sierra Club v. FERC, the agency issued a certificate authorizing construction of the project. The environmental groups challenging FERC’s approval of the project argued that the agency failed to perform a proper EIS. The groups expressed concern that the burning of the natural gas being transported by the pipelines could “hasten climate change and its potentially catastrophic consequences,” and that FERC had failed to take those effects into account when developing its EIS. After FERC denied the groups’ request to halt construction of the project, the groups sought review by the U.S. Court of Appeals for the District of Columbia Circuit—the federal court expressly granted authority by the Natural Gas Act to hear challenges to FERC’s orders. The question for the court was whether FERC was required—in completing its EIS—to consider the fact that the natural gas carried by the pipelines would ultimately be used in Florida power plants, which would generate electricity and emit greenhouse gas. The Efficient Market Hypothesis is an investment theory that I have discussed here before (February 21, 2017 and November 21, 2017). It states that in free markets, prices reflect all available information. It’s high time that we make it mandatory to factor in the impact of climate change on every economic decision that we make. 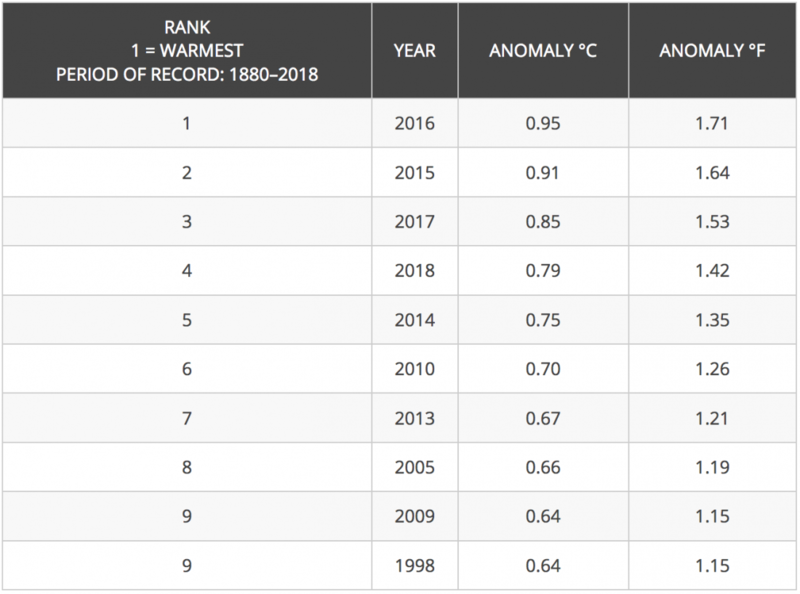 Technically, this is feasible by using the dominant future scenario—currently based on the business as usual scenario (RCP8.5 in the IPCC lingo – see October 28, 2014 blog). The EIS can be examined periodically to reflect changes in the prevailing scenario. The scope of such a policy change will be narrower than that of the “Green New Deal” and it has a higher probability of attracting Republican votes and being effective in its contributions to mitigation and adaptation of climate change. I interpret standing tall as holding your head up and meeting oncoming challenges rather than burying it in a pile of sand to avoid reality (see the October 16, 2018 post on ostrich myths and the American government’s deliberate obtuseness on certain matters). The article informs us that one of the last remaining climate change deniers resides in the White House, and is about to impact official reports—ones that fortunately, up to now, had remained disconnected from politics. In related news, on the same day, the media cited sources who claimed that Dan Coats, the Director of National Intelligence, is about to be fired. The reasons given did not include the recent intelligence report that I mentioned above but rather his public statements about US interactions with North Korea. That said, nobody that I know has any doubts about what this will mean for future reports on the topic. The intelligence reports are published every four years (see May 23, 2017 blog) so the next one will come out after the coming presidential election. We will see how that will play out. To stand tall, we have to believe our own data and act on them—not give deniers the opportunity to “objectively” refute scientific evidence. Nor is this trend of denying data restricted to the federal level. The October 16, 2018 blog, which I mentioned above in connection to ostriches, lists a few cases on the state level—including Arizona, North Carolina and Florida—that actively oppose the use of scientific findings about climate change and its impacts to create legislation that would affect essential economic activities. It is within Congress’s power to ban such practices. A legislation directed at mitigation or adaptation to climate change has a chance to pass both houses of Congress – provided that it maintains a narrow purview. Republicans who already believe in climate change would have the chance to jump on the bandwagon—and possibly reap political rewards. Many Republican senators are facing tough elections in 2020 and public opinion now favors standing tall with regards to both acceptance of and action against climate change. 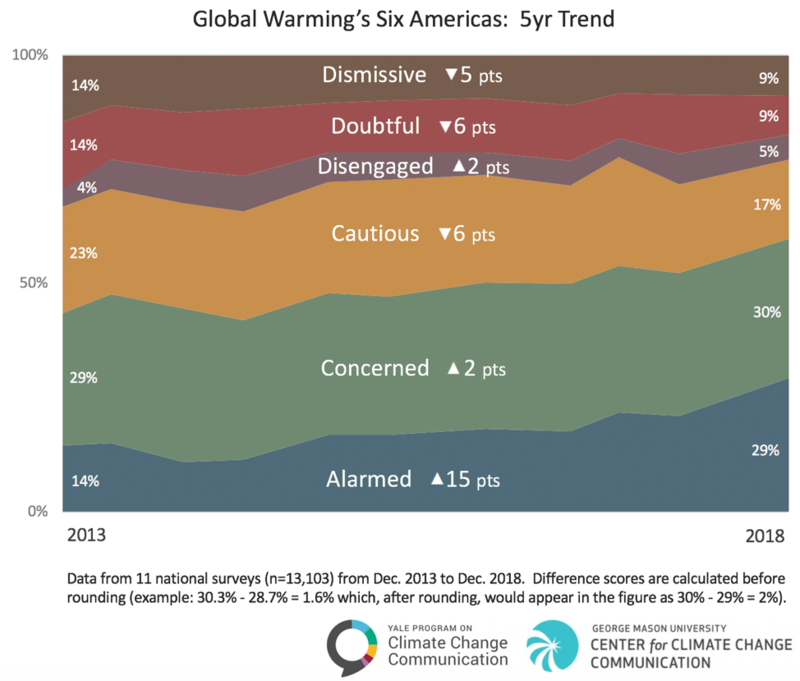 As you can see in Figure 1, about 60% of Americans are either alarmed or concerned; any politician that runs against this trend might face electoral consequences. Effective legislative action doesn’t have to be revolutionary. In next week’s blog, I will try to show that expanding and enforcing requirements for Environmental Impact Statements (EIS) to specifically incorporate climate change impacts could do the trick. The two reports referenced are recent and fully credible, and were approved by the current US government; I have discussed both on this blog. The Fourth National Climate Assessment was officially and directly approved by the federal administration. Separately, the American representatives to the IPCC gave their approval to the IPCC 1.5oC report. This paragraph also focuses on the responsibilities that the US bears for climate change. From here the resolution shifts gears to address the economy, income inequality, stagnation, general injustices, etc. within the country. It looks at our history, from the New Deal to WWII, and moving forward. The first resolution covers a great deal of territory, spanning well beyond the environment. The second one, that I am not showing, specifies over 10 years’-worth of steps in national mobilization necessary to accomplish all of these goals. In each chamber of Congress, four forms of legislative measures may be introduced or submitted, and acted upon. These include bills, joint resolutions, concurrent resolutions, and simple resolutions. Both the House of Representatives and the Senate follow similar rules when making decisions on any of these actions. Both bills and joint resolutions are used when the focus is on making laws; a joint resolution can also be used to propose an amendment to the Constitution. Both concurrent and simple resolutions are used to delegate official internal Congressional business. I assume that this is submitted as simple resolution for official congressional business, not as a bill or joint resolution intended to become the law of the land. I also imagine that Ms. Ocasio-Cortez can count probable supporting votes and thus doesn’t presume that even if approved by the House of Representatives, Senate approval will follow. 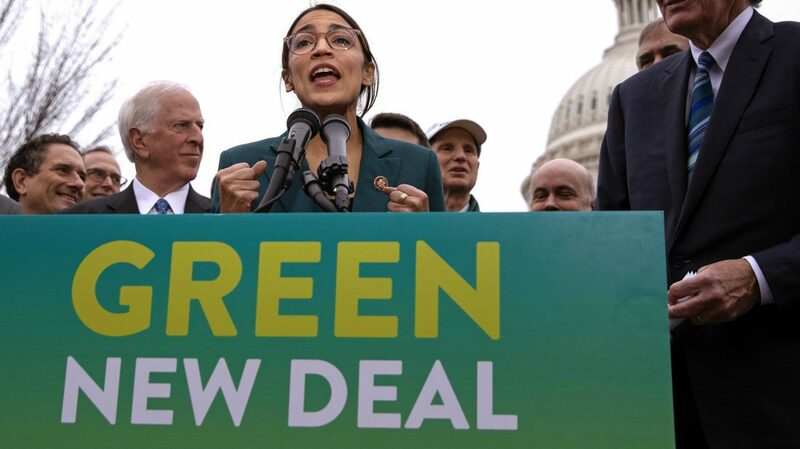 Senate Majority Leader Mitch McConnell said Tuesday that the Senate would vote on the “Green New Deal” introduced by Sen. Edward Markey, D-Mass., and Rep. Alexandria Ocasio-Cortez, D-N.Y., last week. The proposal, which is not expected to pass the GOP-dominated upper chamber, could force some Democrats to make a politically awkward calculation. Omitting some of the specificity in terms of timing, the resolution resembles the UN’s “Sustainable Development Goals” (SDG) that I described in the October 6, 2015 blog. The resolution could be much more effective if it separated the “green” part from the “New Deal” part. Next week I will look at possible alternative strategies that might achieve similar results while possibly attracting more bilateral support.